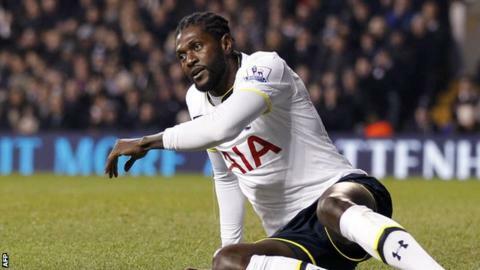 Striker Emmanuel Adebayor has played his last game for Tottenham, head coach Mauricio Pochettino has confirmed. The 31-year-old is yet to feature for Spurs this season after being left out of both their Premier League and Europa League squads. "I think it's clear he's not in my idea, in my mind or in the plans for the future of Spurs," Pochettino said. The club had been trying to terminate his contract, which has a year to run, but Adebayor wanted a £5m pay-off. According to reports, Tottenham had been willing to pay a portion of that amount, but the player is said to have refused the club's offer. West Ham were keen to sign the forward, who moved to White Hart Lane on a permanent deal in 2012 for £5m. Aston Villa wanted him on loan, but both were put off by his high wage demands. Adebayor, who signed on a permanent deal in 2012 for £5m, is yet to feature for the club this season. Meanwhile, Pochettino said £22m summer signing Son Heung-min will make his debut at Sunderland on Sunday. "Son scored three goals in his game for the national team and arrived on Monday and trained very well all week," the Argentine said of the 23-year-old.